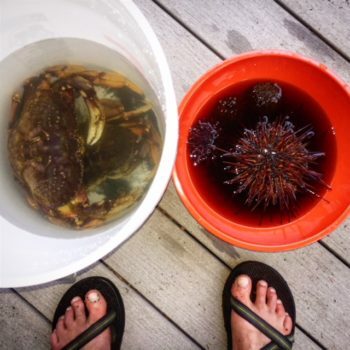 This past weekend, I finally purchased a crab pot and went crabbing using my SUP! Following tips from a fishing guide friend, and learning while doing, here’s some 14 basic SUP Dungeness / Red crabbing 101 tips! Get a light collapsible crab pot that can be easily carried on your board or in-car before/after use. I got this one. Note many of the cage door clips broke when we were trying to figure how to use the pot. So we attached the doors closed with bungies and little carabiners. Get lead rope to the approx depth of where you’ll be dropping it. My friend suggested 100′ of line, but the spot I’ll mostly be using was only 30-40′ deep so I’ll be shortening my line. *Do keep in mind tidal depth changes. I kept an extra 10-15′ of line given we have big tidal shifts and wave action in that spot. Make sure to securely attach the rope to the pot. I figured to the side was best to easier hoisting up. That did work. I find many loose buoys and crab pots in Puget Sound which get caught up in sea life. Get a bait box and secure to the middle bottom of the pot leaving crab doors free. I used velcro straps. Crab food: Use chicken drumsticks, salmon scraps, herring, turkey necks. Chicken worked well for us. Think about a mesh bag inside the bait box in case your scraps fall through the bait box wires. Get legal – Purchase a crab license. Use garden or leather gloves to haul up the rough surfaced lead line. Figure out which board would be best for hauling out and if you need to secure the crab pot to your board. I used a large carabiner to secure to a D-Ring on the nose of my inflatable so that it wouldn’t slide off while paddling out and in. I had to go through light surf and swell. Then had to worry about where the line and buoy would sit. I have experience hauling race buoys in/out so had some idea about securing the line. 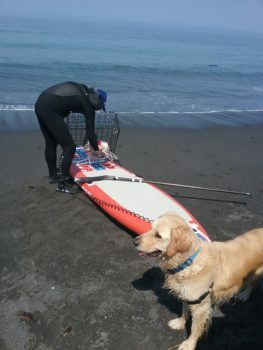 If launching in surf or a steep beach, have a friend ready to help you haul the crab pot and/or SUP up from the surf zone. When I timed for small wave sets to get in, I found myself in a pickle with large sets coming and was unable to haul the pot and board further up the steep beach. My partner Christy helped me the second time. Bring your crab measuring tool out if you don’t plan on hauling the pot to the beach. Use a bucket to haul the crabs in. For us newbies, we had to use the reg manual to determine male from female (can only keep males). Have a plan in place to deal with the caught crabs once onshore. YouTube has a few options (too many in fact). Clean your gear with fresh water after use. Get pics and send to the sup board companies. They’d love to see your efforts using their gear! 2 male Dungeness crabs caught on a sup. Urchins donated by divers at a local beach.